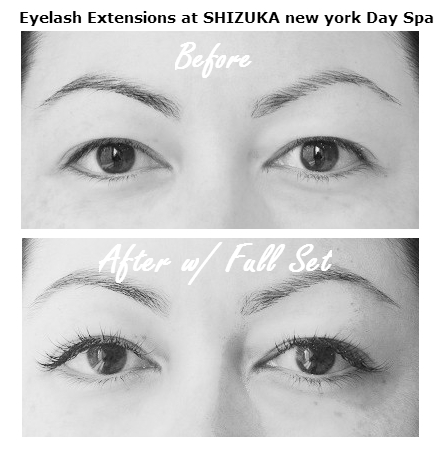 All eyelash extension treatments at Shizuka new york are completely customizeable according to your needs. Extension choices include curl, length, and thickness. We offer two eyelash curls: the J Curl and the C Curl. As the shape of the letter suggests, the J Curl offers a slight curl at the end while the C Curl offers a curl that starts nearer to the root of the eyelash. Both looks open the eyes and add more volume to your natural lashes. The full set below features J curl lashes affixed using a variety of different lengths: 10, 11, 12, 13 cm. Your technician will be able to further asses and recommend the best combination of lengths to achieve the exact look you want. Whether you’re going for dramatic or a naturally subtle enhancement, eyelash extensions can open up your eyes and elevate your look to the next level. Eyelash extensions are highly recommended for special events like weddings, parties, or everyday beauty enhancement! Read on for tips to keep your lashes looking perfect longer. Get a professional consultation before getting eyelash extensions affixed to your natural lashes. You want to make sure you get the best look for your buck! Let Kim Kardashian have her own look, let’s find you yours! By assessing the condition of your natural lashes, a licensed esthetician will help you decide on the best curl and length for your ultimate beauty enhancement. Eyelash glue can take up to two days to firmly bond to your natural lashes so avoid getting them wet as much as possible. Be sure to protect them while showering and washing your face and completely avoid activities like swimming and those that involve excessive sweating like using saunas and working out. If you go in the water, wear goggles to protect those lashes. Use makeup removal wipes to gently remove makeup from the eye area. Avoid using cotton balls or pads as cotton fibers can get stuck in lashes and make them fall out sooner. A little extra care everyday can extend the life of your lashes in the long run. Most mascaras will interfere with eyelash glue lessening their bond to the eyelash extension. Mascara, especially oil-based ones, can be difficult to remove which can further weaken and limit the life of the eyelash extension. Added benefits of getting eyelash extensions include giving mascara and eyelash curlers some time off. Enjoy it! You’re bound to get eyelashes wet in the shower or after cleansing your face. When this happens simply reset them by combing them gently with an eyelash comb and blow dry them with a hairdryer set on its coolest setting. Using hot air will further weaken the eyelash extension adhesive. Sleeping on your stomach or on your side can cause eyelash extensions to bend awkwardly throughout the night making them difficult to deal with in the morning. In order to protect lashes during slumbering hours, sleep on your back instead.